In order to make two bodies move with respect to each other, we have to connect them by joints. Joints do not have any mass or rotational inertia. They only constrain the motion of bodies. The position of a joint is indicated by its reference frame. Because the joint position and orientation is completely determined by the bodies that are connected, you do not have to specify any position or orientation parameters. These are automatically derived when you make connections. Making connections is not difficult when you understand how frames work. We will explain this with a simple example. Suppose we have two bodies and a rotational joint. The initial positions of the bodies and joints are indicated by their reference frames. Now we have to define for each of the two bodies the offset to the joint. This can be done using connection points. A connection point is in fact a new frame with an offset from the body reference frame. As you can see, in the picture below, we have defined ConnectionPoint1 with an offset of [x = 1, y = 1, z = -1] with respect to the Body1 and we have defined ConnectionPoint2 with an offset of [x = 1, y = -1, z = -0.3] with respect to Body2. Now the bodies and the joint can be assembled by changing the body positions in such a way that the frames of the connection points coincide with the reference frame of the joint exactly. Suppose that Body1 is set as the reference body. Now the whole assembly will be moved until Body1 has its original position. In the 3D Mechanics Editor most of the assembly of joints and bodies is automated. You simply have to make connections between joints and bodies. To make a connection you have to drag and drop bodies and a joint to the Edit window. Then change to Connection mode ( ). First click a body and then the joint it should be connected to. 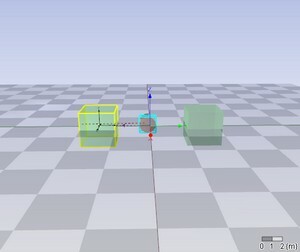 After the dialog is closed the body will automatically assemble with the joint. 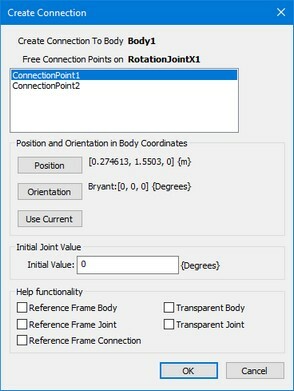 When two bodies are assembled with a joint, you can view their constrained motions. When you want to change the Connection Points after the connection has been made, you have to double clicking the joint. This will open the Joint Properties Dialog. You can change the name, position, orientation, and the rotation axis of the connection points. You can also change the joint type and the initial rotation or translation of the joint. If you lock the joints, it will not move when you want to show the possible motions of the system. At the bottom of the Joint Properties you can click the More button to see the advanced properties. The advanced properties of the Joint Properties Dialog. • As Constraint Joint: Calculate the joint using constraints. You can use constraint joints to introduce flexibility into your 3D structure. • Power Interaction Port: add a power port to the joint to make it an actuated joint. • Output Position: Create an output signal that gives the joint position. • Output Velocity: Create an output signal that gives the joint velocity. • Output Constraint Forces: Create an output signal that gives the forces and torques that act on the joint. 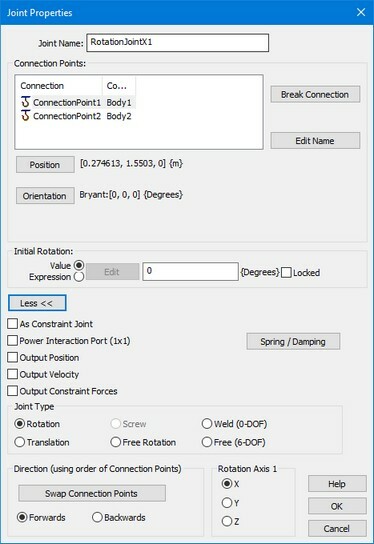 If you click the More button to see the Advanced Joint Properties, you can click the As Constraint Joint selection box. This box allows you to manually choose to make this joint a constraint joint. A button will be visible showing the Constraint Settings. if you click this button a dialog is shown allowing your to override the constraint by a spring damper. In this way you can set each individual joint by its own spring damper constants. If you click the More button to see the Advanced Joint Properties, you can click the Spring Damper button. This will allow you to add damping to a joint or a spring and define end-stops. 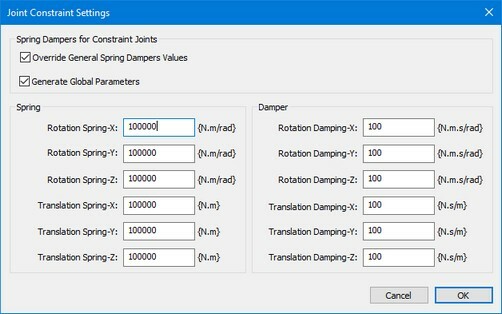 • Has Spring: choose this option to define a spring parallel to the joint. 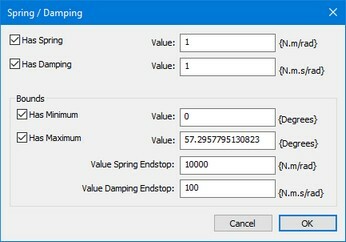 • Has Damping: select this option to define the damping (linear with the velocity). • Has Minimum: set an endstop at the minimum joint rotation/extension. • Has Minimum: set an endstop at the maximum joint rotation/extension. 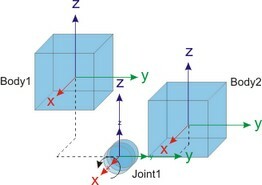 Joints which rotate around the principal axes. Same as XYZ-Rotation but with a different representation. Balljoints with orientations of the principal axes. A joint that welds two bodies together. Opposite of the weld joint. In practice this joint will only be used to give a body a fixed starting position with respect to another body.